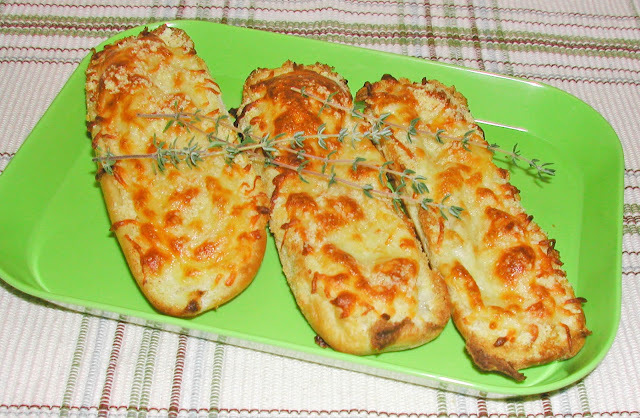 A good use for extra hot dog buns is to make garlic or garlic cheese bread from them. We never eat a whole package of buns and when I want something quick to go with a hot dish or spaghetti this is quick, cheap and uses up another bread leftover. I made them for our kids when they were little as they are easy for kids to handle and teenagers seem to like them as a snack. Also no slicing. Basically there is not a recipe as such, use the cheese you have on hand or none if you don’t have it handy. We like shredded mozzarella or Italian blend cheeses and some grated parmesan sprinkled on top. For two buns (4 bread sticks) cut in half. Mix about 3 tablespoons of soft butter with ¼ to ½ teaspoons of garlic powder, or too taste. I tend to go a little heavy on the garlic as both Bettie and Lyle like it. Stir in some dry Italian style herbs either mixed or use a combo of thyme and oregano. Again what ever your family likes and you have on hand. I love your use it up concept. It is what I was raised with and what I use daily. Don't waste anything. Hot dog buns make excellent toast too! I love your blog. Thanks Dee, I hadn't thought about using the buns for toast sounds like a great idea. Glad you enjoy the blog. My mom made these when I was a kid. I used to love them! More years ago than I care to count. We always enjoy when someone tells us that we have helped them remember a Happy Memory.